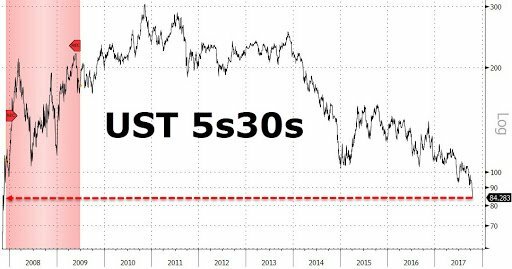 One of the most reliable recession signals in history is the Treasury yield curve. The long end of the yield curve is warning of trouble. The 5/30 year bond yield spread has now fallen well below where it was just before 2008. 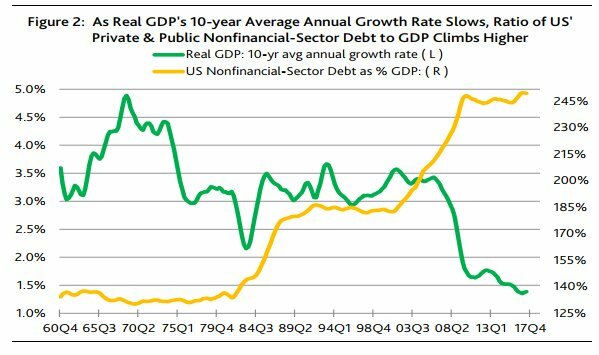 Using debt to stimulate growth has had diminishing returns for 50 years now! This is an early signal but investors should watch this carefully as it plays out in 2018. One of the most reliable recession signals in history is the Treasury yield curve. While the Fed and Trump’s tax cuts have boosted short term expectations of interest rate rises and growth. The long end of the yield curve is warning of trouble. First of all, the rate expectations only went into the very short end of the interest rate curve. Long term interest rate if anything fell further relative to short term interest rates. The chart above shows that expectations of 2018 interest rate rises took off from the beginning of September this year. The blue line in the chart above, shows the spread between rates for December 2017 and December 2018 rose significantly following the Fed’s September announcement and increased hopes for Trump’s tax cuts. 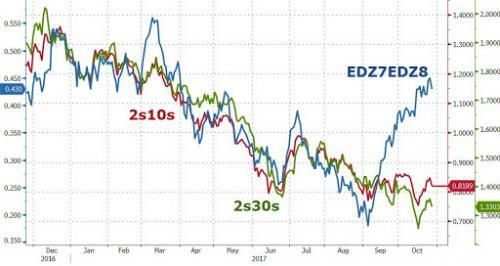 However, at the same time, the spread between 2 year and 10 year, and 2 year and 30 year bond yields remained flat or even fell further. The chart below shows that each time the Fed has tightened in this cycle, the 2/30 year curve curve has continued to flatten even further! Below we can see that the 5/30 year bond yield spread has now fallen well below where it was just before 2008. It has never been anywhere close to this level since! This should be a warning to the Fed. Long term interest rates are sending a clear signal. What this shows is that too many interest rate rises bring on a recession, and the yield curve shows you when and reliably so. History suggests we could already be there. The chart below shows that policy has been losing its effectiveness for a long time now. Using debt to stimulate growth has had diminishing returns for 50 years now! The Fed is now playing with fire. If growth rolls over at these low interest rates, how will it get out of the next recession? If the bond market is already sending a warning, how much further can the Fed raise rates?